The moment I saw the headline of Oscar de la Renta’s passing on my MSN homepage when I turned on my laptop Monday night, I sighed at the sad news…and then gave a slight smile. Though it’s always tough to hear of anyone’s passing, I would argue that 82 years, over 50 of them as one of the world’s most respected and legendary designers ever to grace the runway, is a good life; particularly, when you take into account that many people don’t make it that far in age…or in success. What’s been quite moving this week has been catching the tributes here and there as they came in. I was especially fond of reading Anna Wintour and Sarah Jessica Parker’s words as they reflected on an old friend. I found myself looking back at all things Oscar de la Renta throughout the week…and that smile appeared again, this time much bigger without an ounce of sadness as I sifted through hundreds of pictures and years of fashion. What a fun contribution, body of work, and legacy to leave behind. I wouldn’t personally describe myself as the biggest fashionista of them all, because I’m not, but I certainly love a beautiful dress when I see one. 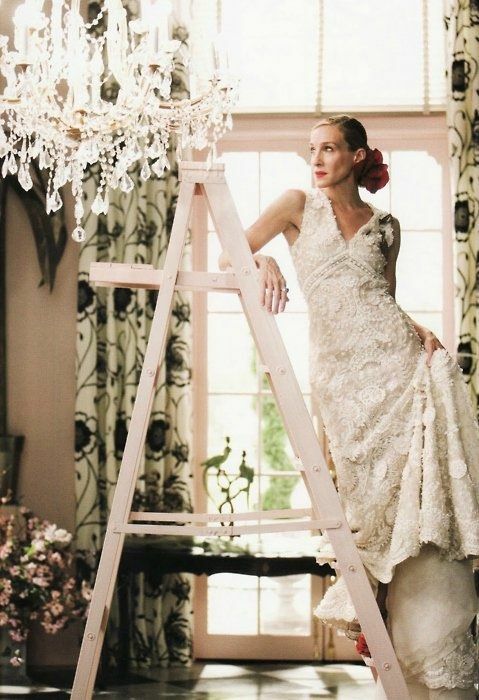 They say “never say never,” but I’ll likely never have an original Oscar de la Renta hanging in my closet – and yet, it’s still dreamy (and quite fun!) to admire the poetry and pure art if you’re one of the lucky ones who have. It comes down to how I imagine it must feel for any gal wearing Oscar de la Renta: like a modern-day princess, in the middle of a real life fairy-tale. Thank you, Mr. de la Renta. You sure helped make it fun to be a woman.